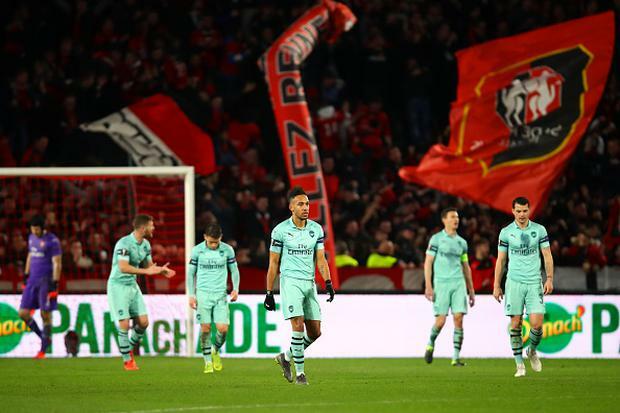 Arsenal suffered more Europa League away day blues as their 10 men were well beaten by Rennes in the first leg of their last-16 tie. The Gunners raced into an early lead courtesy of Alex Iwobi but a first-half red card for Sokratis Papastathopoulos turned the game in favour of Rennes. Hatem Ben Arfa, facing his former Paris St Germain boss Unai Emery, looked sharp as a stunning strike from Benjamin Bourigeaud, Nacho Monreal's own goal and a late Ismaila Sarr header saw the hosts run out deserved 3-1 winners. Arsenal had to turn around a first-leg deficit in the previous round after slipping to defeat at BATE Borisov but at least have an away goal to take back to north London. Not even 24 hours removed from Manchester United's memorable Champions League comeback across the country in Paris, Arsenal slipped to a dour defeat. Applications for tickets could have sold out Roazhon Park three times over and the home support made a cauldron of noise which only intensified as their team took the tie by the scruff of the neck. United are the visitors to the Emirates Stadium on Sunday, such an important Premier League game sandwiched between the two Rennes fixtures. Emery knows his side will have to be better than tonight in both of those games to keep their return to the Champions League - via a top-four finish or winning this competition - a real possibility. The evening had started well with Arsenal ahead inside four minutes as Iwobi misplaced a low cross and it caught out goalkeeper Tomas Koubek, nestling in the corner of his net to give the Gunners an early away goal. Iwobi then almost turned provider, again breaking down the left before squaring across the box for Lucas Torreira to sting the palms of Koubek with a driven effort. Sokratis was booked for bringing down Ben Arfa as he looked to break on the Arsenal goal, the winger's resulting free-kick saved low to his right by Petr Cech. It was not too long before the Greece international was given his marching orders, shown a second yellow card in a matter of seven minutes for hauling back Sarr. Arsenal were made to pay immediately, Ben Arfa's free-kick hitting the wall only for Bourigeaud to thrash home the rebound from 20 yards and draw the hosts level. Rennes started the second half like a side with a one-man advantage and Bourigeaud shot straight at Cech as the Ligue 1 side looked to take the lead. Emery responded by bringing on Matteo Guendouzi for goalscorer Iwobi, but it was Rennes still on the attack and the busy Bourigeaud was inches away from turning home Sarr's cross after he outpaced Monreal. The midfielder had his back up and tested Cech once more before Sarr also hit the target with an effort of his own, Arsenal struggling to keep possession and dropping deeper as the half progressed. Another Ben Arfa free-kick was pawed behind by Cech but the lead soon belonged to Julien Stephan's side - and it was Arsenal who gifted it to them. A number of defensive errors culminated in Monreal miscuing a clearance and turning Mehdi Zeffane's cross past Cech for an own goal. Ben Arfa, celebrating his 32nd birthday, brought the best out of Cech after Mustafi had fluffed his lines and passed straight out to a red shirt. Emery appeared to accept a narrow loss rather than risk further damage by chasing an equaliser, replacing lone forward Pierre-Emerick Aubameyang in the closing stages. But his side will have to reach the quarter-finals the hard way after Sarr's diving header after 88 minutes compounded a poor night for the visitors.